"...what a long, strange trip it's been." "...all reporters are advocates...People should be skeptical of everything they read. In fact, people should be more skeptical of reporters who claim not to be advocates, because those people are almost always lying, whether they know it or not." from "Hey MSM: All Journalism is Advocacy Journalism"
Readers coming to this post to find more about the latest claim, absurd comment, lie, example of hypocrisy, blatant contradiction or baseless conspiracy theory from Glenn Beck would be best served clicking on the Right Wing Watch logo below. This post is a swansong, a farewell to a project that has taken up a lot of time and energy and must now be wrapped up. The following is a summary of over three years of learning, critically observing of and listening to Glenn Beck and his "politivangelism," to use an apt word coined by someone on the Mediaite blog to describe his style of "commentary." 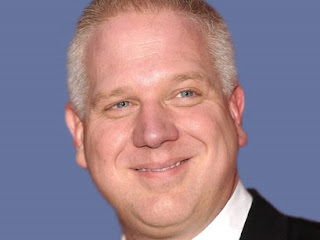 Glenn Beck has many character flaws and disturbing characteristics. One that has not been covered at length here is his tendency to come up with conspiracy theories that suit his paranoid style. Previously, Mr. Beck's Crime Inc conspiracy and his Boston bombing conspiracy have been debunked in this Review. Recently, Beck has questioned why the entire media (in a conspiracy) ignores him and ironically argues that it is because they think that he is a conspiracy theorist. (Apparently whiner Glenn Beck is out of touch with conspiracy theorist Glenn Beck. More on Beck's lack of self-awareness in video below.) That could be one reason, but more likely, it is because of Beck's sleazy and deceitful propaganda against progressives and especially against President Obama. Recently, Beck and the other two stooges on his morning (zoo) radio program did a bit about Obama (D) and Governor Christie (R) being gay in a piece entitled online "Brokeback Boardwalk: Obama and Christie Rekindle Bromance." Asserting, to the delight of many of his followers and the disgust of some, that the President and Gov. Christie are gay lovers is not the approach that any serious adult will perceive as responsible political commentary. Beck is not ignored by the media just because he's a conspiracy theorist; Beck is ignored because he's not an adult in the spectrum of media. He is not "the adult in the room" to quote an oft-used phrase. Can't figure out why the media ignores him. REALLY? Glenn Beck is a serial hypocrite willing to forget his supposed principles when convenient. That alone supports the charge that Glenn Beck is a charlatan. As a persuasive conman, his propaganda and "insane" take on reality has created a following that comes across as "psychotic." Glenn Beck certainly is a conspiracy theorist, and they are made up by his imagination. Glenn Beck has a reactionary agenda. His followers know that; so does the media. The variety of truths, dependent in part on the range of values different people have, about Mr. Beck (or any political reality) is the one and only original idea developed in this blog. Readers seeking more information about Beck's political values, dishonesty, ignorance, background, development, methods of communication, followers and enemies would benefit from scrutinizing the Contents of this Review, available in the link at the top of every post. Some of Beck's supporters have claimed that this Review is "propaganda," but that is partly because they do not appear to understand the nature of propaganda nor can they distinguish it from honest criticism. A propagandist would make false claims against Mr. Beck and never make a point of showing when he is correct in his criticism of the President nor defend his intelligence. Glenn Beck is not stupid! Beck asks people to give money to support victims of disasters. That is good for Mr Beck. Glenn Beck is a freak of media. When an athlete is considered to be a "freak of nature," that is usually a complement. Beck is unlike anyone else in the media. An entertainer pretending to be serious, a hypocrite with an agenda accusing those in the mainstream media of having an agenda, a reactionary propagandist who rails against propaganda...the list goes on and on. A perfect example of Beck's ironic and complete lack of self-awareness is conveyed in the following clip when he simultaneously explains why 9/11 conspiracy theorists are fools and why freaks of deceptive media should be ignored. Astonishing. "If I'm Satan...." Well, Mr. Beck, that shoe fits. These last three years have been an extraordinary learning experience, and for that, Glenn Beck is appreciated for motivating the research and fact-finding this blog has entailed. Beck is a complex and strange man. Despite the repeated false claims online by a handful of Mr. Beck's supporters, there is no hatred here for Mr. Beck, nor is there is any love for President Obama. There has been a conscious and purposeful effort to include criticisms of Mr. Beck on this Review by many other people, both from the left and the right. This has been done to convey that the criticisms made against this freak of media are not some personal vendetta against him. Beck needed and still needs to be exposed for what he is. Luckily, Mr. Beck has been marginalized ... for now. He is, however, trying to make a comeback and get his BlazeTV on cable and satellite providers; and he's been successful to an extent. This blogger is done with Mr. Beck, but Beck is not done with his often childish and always deceitful campaign of extremist, reactionary propaganda against progressives and progressivism. Beck will someday die plotting his next project to inspire and motivate people to embrace a version of the past that never was. Because of Glenn Beck, this blogger has an appreciation for biased assimilation of facts, the cognitive dissonance that accompanies the conflicts between beliefs and contrary facts, a better understanding of the media and of media criticism (both from the left and the far right) and the unwillingness of people to grasp the truths about Mr. Beck, as laid out above, when they want to believe him and believe in him. That has been the greatest challenge and the biggest failure of this Review. Until his followers are ready to question Mr. Beck for some reason, they cannot and generally will not try to wrap their heads around Beck's fundamental dishonesty. People on the right, i.e., conservatives and reactionaries, are more critical and more aware of lies, hypocrisies, bias and agendas coming from those on the left and in the media in general. People on the left, i.e., liberals, progressives and radicals, are more critical of lies and hidden or explicit agendas from those on the right and in the media in general. No one is purely objective because everyone involved in the media and politics have values, and these values contribute to decisions about what to report and how to report it. That is why a right-wing media and echo chamber has developed in the U.S. The left has their own media and echo chamber although it tends to be more diverse in its values and biases. This makes it very difficult for people, especially busy people, to dig down and get to the truth of the matter. Two hours of time devoted to understanding the truth about the day's news, political issues and "scandals" is too much for most people to spend, but the balance is necessary if truth is desired and not just "information" that people want to believe. Watching Fox Report with host Shepard Smith at 7 p.m. EST and then All In with Chris Hayes at 8 p.m. EST on MSNBC would offer truth seekers a balanced understand of the days' news. Alternatively, watching the NBC Nightly News with Brian Williams and then On the Record with Greta Van Susteren at 10 p.m. EST on Fox can provide balance lacking from watching just the left-wing, mainstream or right-wing media. Unfortunately, that will not happen as most people on the left and the right want their beliefs reinforced by the media they consume and most everyone else is too busy to spend that much time getting the truth about a current event, scandal or policy proposal. It would, however, make a good project for a current events class in high schools. Life is too short to remain focused on one freak of media for too long. Wrapping this up by conveying why Beck should be ignored by the media and anyone interested in the truth is as good of time as any other since Beck departed ways with Fox News. It is time to move forward to more important issues, more important causes than exposing one media personality for what he is. Writing this Review has been fun, exasperating, frustrating and enlightening. For that, a debt of gratitude is owed to Mr. Beck. For the damage he has wrecked on political discourse and the true believers, Glenn Beck is owed a debt of opprobrium from the media, from his critics and from anyone who values truth over sleazy, deceitful propaganda. That would include his own fans if they would spend more time checking his "facts." There have been many collaborators with this Review over the last three years. Some used anonymous names to protect themselves from Mr. Beck's followers; others did not. A warm word of thanks goes out to Roger Fallihee, Jonathan Schell, Tim Wise, Leslie Savan, Mark Howard, Karl Rogers, author of Debunking Glenn Beck, Alex Zaitchik, author of Common Nonsense: Glenn Beck and the Triumph of Ignorance, Lisa Houserman, Paul Westlake, Karl Frisch, "William Holden," Dr. Cynthia Boaz, "Sarah Jones," Elaine, "Anton," Angelo Carusone of StopBeck.com, Media Matters for America and Right-Wing Watch. Media figures (Cenk Uygur, Chris Hayes, Alex Jones, Lawrence O'Donnell, John Stewart, Steven Colbert, Bill Maher, Rachel Maddow and others) either quoted in these posts or used in video clips to assist in the many criticisms of Glenn Beck are greatly appreciated. The many bloggers across the Internet, who have added The Glenn Beck Review to their blogrolls, are also given a huge thank you.